Location: Kinnaird Estate is situated in Highland Perthshire amid dramatic scenery and known as an estate of outstanding beauty. About your host at Kinnaird Estate: Team, Kinnaird Estate. We are located just over one hour north of Edinburgh and thirty minutes north of Perth. The estate offers a range of attractive self-catering cottages and farmhouses, sleeping from 2 to 8 people, each with its own unique character, situated at various idyllic locations on the 6,500 acre estate. ­­­­­­Game shooting and fishing experience at Kinnaird Estate: Having some of Perthshire’s best ground for pheasant and partridge shooting, we are able to organise excellent and rewarding days’ sport on the estate before returning to the comforts of one our cosy cottages. We also offer clay shooting. 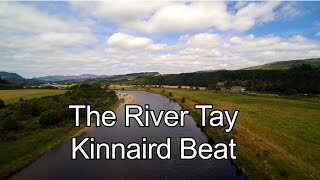 The renowned Kinnnaird beat is arguably the most prolific fly fishing beat on the entire middle Tay. Fresh run fish are present in the Kinnaird beat from January onwards due to the early run of Loch Tay salmon and the early arriving River Tummel salmon which back up in this magnificent beat throughout the Spring months. The fishing increases in potency from March onwards with more and more salmon seeking refuge in the unique pool formations from which Kinnaird is fortunate to benefit. Click here for quick link country guide. To select and book the top suggested hotels and accommodation in the area when shooting at Kinnaird Estate, click here. by car or public transport to Kinnaird Estate.